Among its fans, Bulletstorm is known for its over-the-top gameplay and dialog, but another thing that always comes up in any conversation about Bulletstorm is how beautiful it is. This is due, in no small part, to its Art Direction. The team at People Can Fly went to great lengths to create a world that is as nice to look at as it is hostile. When you think about it, it’s a pretty tough thing to pull off, but Bulletstorm did so quite smoothly. It perfectly rides the line between insane chaos and peaceful beauty. Ok, we admit – maybe “peaceful” isn’t the right word, but there’s a lot of beauty there nonetheless. 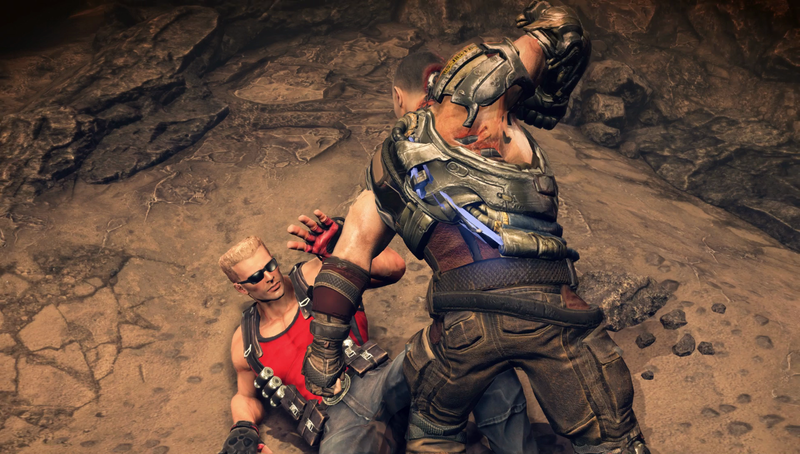 For the uninitiated, Bulletstorm is the story of Grayson Hunt, an assassin-turned-space- pirate who, along with his crewmate Ishi Sato, must navigate the unwelcoming surface of the planet Stygia with two goals in mind: get off the planet and take revenge on the man that put them there – their former commanding officer General Sarrano – in the process. What follows is an explosive and intense adventure that’s truly unforgettable. As you can imagine, creating a world this rich is no small feat. Luckily, the team at People Can Fly was up to the task and set about laying the foundations that would define Bulletstorm’s visual identity. 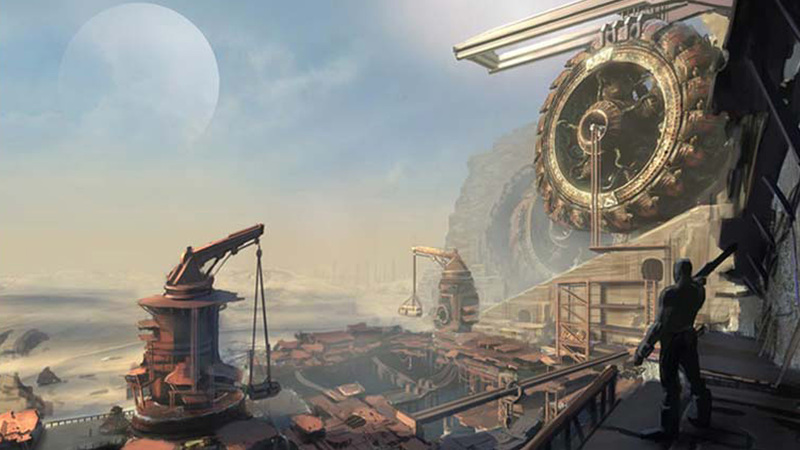 Through a host of different influences and multiple stages of refinement, the art team managed to conceive a world that has since gone on to define Bulletstorm. We wanted to know more about that process and how it relates to the upcoming release of Bulletstorm: Full Clip Edition, so we caught up with Krzysztof Dolas, Art Director on Bulletstorm: Full Clip Edition and twelve-year veteran of People Can Fly, and asked him to share a few insights with us. 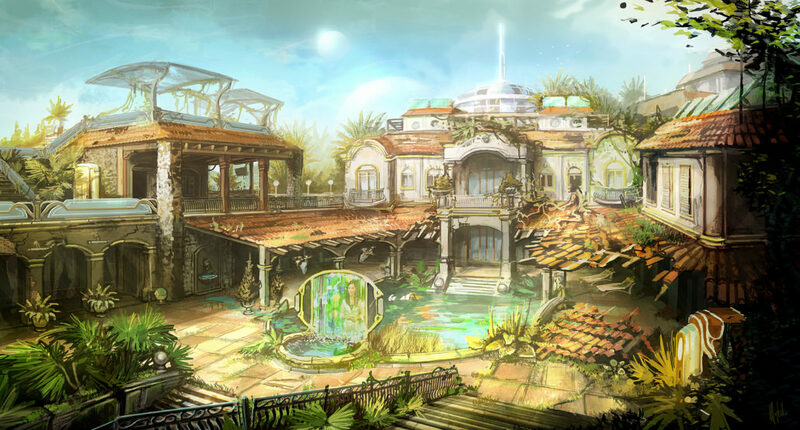 What were the initial goals of the art team in Bulletstorm? Back then, PCF had just become a part of Epic Games. Epic was an icon in terms of a graphical excellence, and almost every artist was influenced by their games. Our main goal was to maintain their standard of quality, while doing our own thing. We thought that the first thing that would differentiate us would be our color palate. A world full of saturated and vibrant color — almost comic like — was the first thing that came to our minds. A dangerous sci-fi world doesn’t necessarily have to be desaturated, but also can’t feel like a children’s cartoon with cheerfully clean hues. It coupled well with one of our design principles: that the world needs to be believable, but not hyper-realistic. The story is akin to the pulp comic book style, so we decided to use post-processing to enhance the visuals even more. Games made on Unreal Engine can tend to have a similar look due to the way they are rendered, so we wanted to push it. We wanted to create something unique that would scream that it’s a fresh new game. What kind of mood was the team trying to convey with the art style? 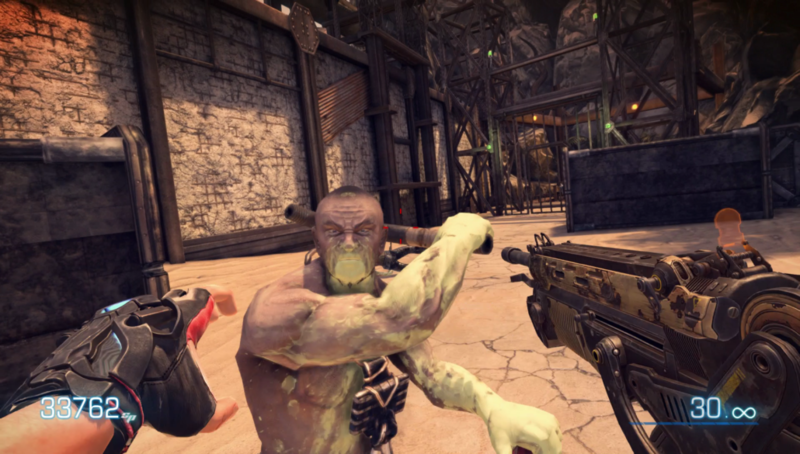 We wanted Bulletstorm to make the player feel like they were taking a great “high-adventure space-opera” kind of journey through exotic and exciting locations, while fighting fantastic and unique enemies. The sci-fi theme is kept down to Earth, so to speak, to provide an oddly familiar feel for the player. The world around them is like nothing they have seen before, yet at the same time it is easy to understand (through references to the current times). We wanted to sell the story about resort planet in the state of decay; we wanted you to feel powerful and unstoppable there. Imagine being Snake Plissken (Escape From New York) and obliterating enemies in a Grindhouse film style using Neo’s (The Matrix) skillset! What were some of primary influences in the art style of Bulletstorm? We always balanced between a comic-like style and fairly believable places that could exist. Some areas were influenced by real places like Chalkidiki in Greece or Andalusia in Spain, but with one big goal: They had to be larger-than-life and over-the-top. We also wanted to push gore to the limit so you’d get accustomed to it like in Grindhouse or Kill Bill. We loved the Cowboy Bebop series and Fear Agent, as well as The Chronicles of Riddick and Serenity. Also, even though we didn’t want to borrow too much from Gears of War, we did like the bulky style of its characters. What was the art direction and iterative process like for Bulletstorm? It was sometimes hectic. Our Art Director at the time, Andrew Poznański often said that it was a big soup of inspirations that didn’t always seem like they went together, but ended up tasting good. The end result is chaotic on the surface, but in the madness there is a glue that holds everything together and somehow compliments the whole vibe of the game. From an art standpoint, what are you most excited for people to see in the newly reinvented Bulletstorm: Full Clip Edition? Finally, we can present players with the game in the form that we had originally envisioned it. We always had to create great art and then reverse engineer it to run on different platforms. Now with the capabilities of current hardware, we can bring it back to its original glory. We can now use the originally created high-detailed models, shaders and textures to create seamless gameplay that won’t break the immersion. Finally, we were also able to upgrade post-processing so that the game looks as we always wanted it to. As you can see, there’s a lot to love about the art in Bulletstorm, and what’s more, that same amazing art style is on display in Bulletstorm: Full Clip Edition – and at even better resolutions. Among the myriad improvements and upgrades coming with Bulletstorm: Full Clip Edition on April 7th, the beautifully enhanced visuals is one of which we’re most proud! 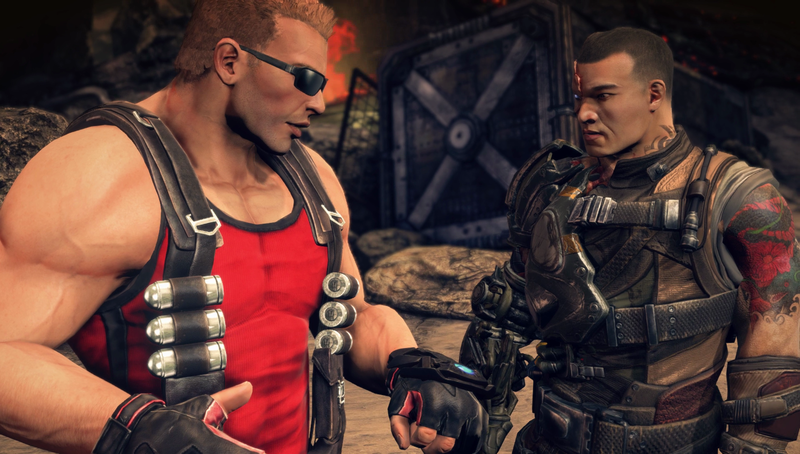 Want to know more about Bulletstorm: Full Clip Edition? Make sure to follow us on Twitter (@Bulletstorm) and Instagram (@bulletstormgame), and “Like” the Bulletstorm Facebook page for the latest news and updates!